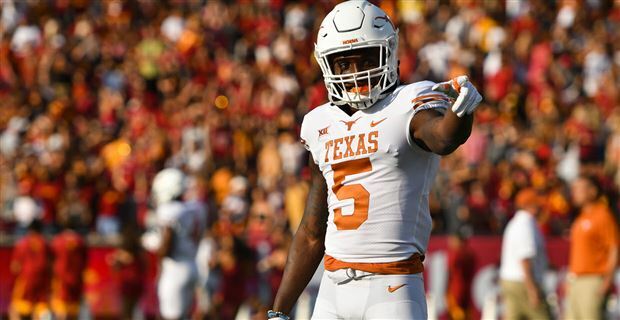 The Vikings managed to land Texas cornerback Holton Hill in undrafted free agency. A talented player with off-the-field concerns, Hill must develop in many ways as his time in Minnesota begins. Daniel House takes a look at his skill-set. Updated: June 5, 2018, 1:45 p.m. When the Vikings landed cornerback Holton Hill in undrafted free agency, they knew based solely off football skills, they were adding a potential top-50 draft talent. Hill slid down down draft boards due to off-the-field concerns, including a college suspension and an alleged failed drug test at the Scouting Combine. According to NFL Network’s Tom Pelissero, Hill has been in rehab classes for his off-the-field issues and is being mentored by veteran leaders in the Vikings’ locker room. It is clear the team wanted to place Hill within their culture to develop him both on and off-the-field. The team signed him to a large signing bonus and managed to swipe him away from nearly ten other teams who expressed interest in signing him as an undrafted free agent. In the NFL, you can never have enough talented cornerbacks to fill the secondary. Hill didn’t display excellent testing numbers, but he plays better than those numbers suggest. His length and physicality help him redirect players at the top of routes. He forces receivers to fight through the catch point to win against him. In some instances, he doesn’t show the best ball skills and may open his hips too quickly to give an ounce of separation. His overall quickness and length allow him to compensate for this as he often gets a hand in passing lanes or breaks up the pass with a physical tackle. His closing speed is off the charts and he often shows off transition quickness to keep receivers tight to him. He made so many big open field plays in the USC game. It is the best full game of Hill you can watch to see what he brings to the table. In the clip below, he manages to recognize the route concept is trying to pick him, so he gets over the top and downhill to make a tough tackle in traffic. These are the type of plays many young cornerbacks can't make as tacklers. Sometimes this leads to penalties because he is grabbing or too physical at the catch point. When his footwork is sound and he uses this physicality as a complement to it, you see shades of lockdown cornerback potential. His game against James Washington at Oklahoma State is the perfect example. He held Washington to four catches for 32 yards, including the plays I selected above and below. The clip below (Hill is at the bottom left of the play) is an example of how he can perform in coverage when all of the technique comes together. You see his ability to swivel his hips and keep the receiver tight without allowing separation. At the top of the route, he uses the physicality to shut down any options for Washington. In the next clip, you see how he can can extend his arm and use his physicality to prevent a potential window for the quarterback to throw the pass. Hill had a few plays where he could have closed on an interception, but instead forced an incompletion. There are situations where he is unable to turn his head around quickly enough. His ball skills aren’t a strength, however, he is in the position to make plays and will cause a disruption of some kind. There are reps where he knocks a pass away because he can get into passing lane. This is valuable, even if he can’t finish an interception. The play below is an example. He doesn't allow the receiver to get separation by pressing him, keeping him tight to his hip and getting into the passing lane with his length. It wouldn’t be surprising if Hill is tested at safety in a pinch because of his overall profile and skill-set. However, the most natural fit is at cornerback. With technique work, he could develop into a complementary player to Xavier Rhodes on the outside. Overall, there are flashes of brilliance in Holton Hill’s game. Hill’s tackling ability, physicality and blossoming coverage skills leave him with so much room to grow in Mike Zimmer’s defense. If Hill can contribute early, the Vikings will suddenly have five solid options at the cornerback position. First round pick Mike Hughes can rotate between the slot and outside, while Hill serves as a reserve across cornerback spots. If Hill stays focused on football and avoids off-the-field trouble, there’s a chance this move could pay off. Mike Zimmer and Jerry Gray have added a player with traits they look for in a cornerback. Hill is in a situation to develop and if he does, it could give the Vikings more flexibility if they are unable to afford Trae Waynes when his contract expires. Time will tell, but Holton Hill has the chance to develop into a solid starting cornerback if he follows the correct developmental track. Another great write up! Keep them coming. I was very surprised no team took a chance on him in the draft. His talent is undeniable. Seems to be doing all the right things up to this point. He could end up being one of the steals of the draft!